We have information you must know before you buy the HR-V. The 2019 HR-V, which gains standard Honda Sensing on EX and higher models and loses the manual transmission option, is available, though inventory can be light due to low profit margins. Offers mentioned below are available nationally and are good through April 30, 2019 unless otherwise noted. Keep an eye out for new offers as we get closer to Memorial Day. 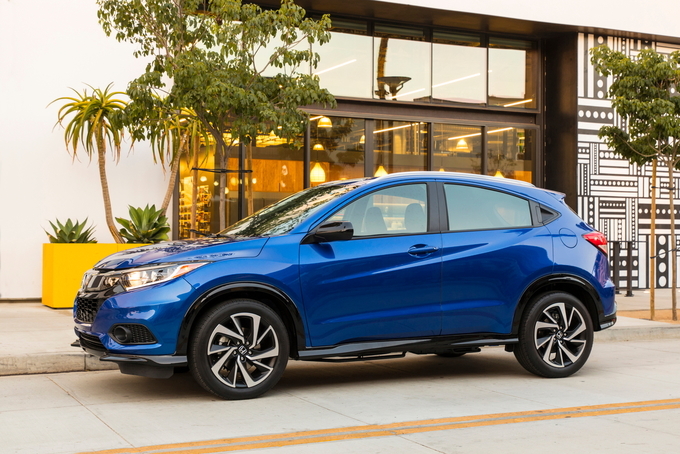 Honda offers a $500 unadvertised incentive ($300 reduction) on the 2019 HR-V. Buyers cannot combine this incentive with the low APR deals below. Keep in mind that the dealerships are not required to pass these savings on to you, so shop around for the best deal. If you decide to lease, Honda has $1,000 in lease cash to help reduce the cost. Honda also offers its standard $500 bonuses for recent college graduates and members of the military. 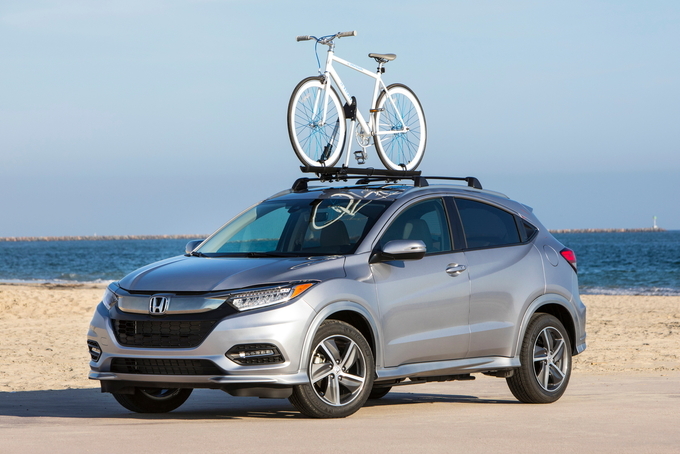 Honda offers qualified 2019 Honda HR-V buyers 2.9 percent APR (up 1 percentage point) for up to 36 months or 3.9 percent (up 1 percentage point) for up to 60 months. They cannot combine this with the $500 incentive above. The entire line of 2019 HR-V leases remain the same in April. These 36-month lease deals start from $209 per month with $2,399 due at signing on the LX trim. With an effective monthly cost of $276, this is is not a good deal relative to its $21,565 MSRP. You can see all the 2019 HR-V lease deals in the table below, but none of them are good deals in terms of payment relative to MSRP. 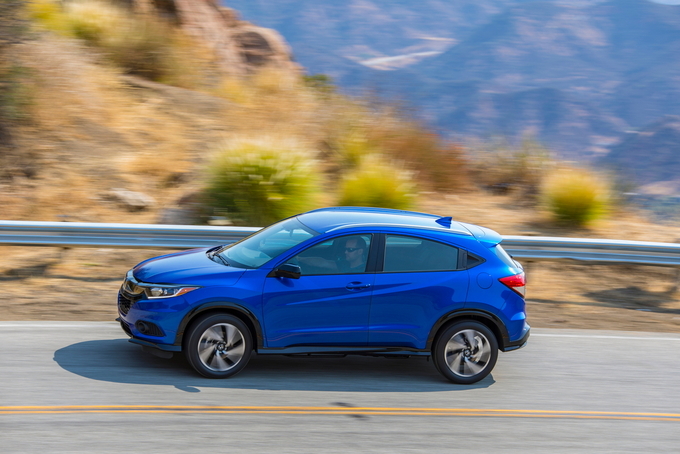 The fast-growing subcompact crossover segment continues to welcome new models, but the 2019 Honda HR-V is one of the more established players among them. It makes the most of its size by offering ample passenger room and nifty ways to carry outsized equipment. Its thin acceleration is the trade-off you make to obtain outstanding fuel economy. 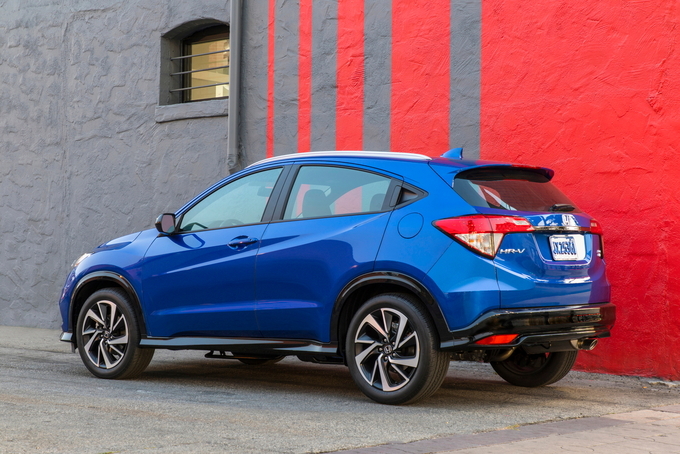 Now in its fourth year, the 2019 Honda HR-V benefits from numerous changes. All models feature new styling, including revised bumpers, grille, headlights, and taillights. Inside, the HR-V benefits from a new Display Audio system with Apple CarPlay and Android Auto smartphone integration. Two new trims, Sport and Touring, join the model lineup. The Honda Sensing suite of active safety and driver-assist features is now available on the EX trims and above. As one of three utility vehicles sold by Honda, the HR-V has two popular models ahead of it: the compact CR-V and the mid-size Pilot. The HR-V takes elements from both and uses its footprint to deliver a satisfactory product. On paper, seating is for five, but four is the ideal. Its storage space is quite good, measuring 24.3 cubic feet, or 53.1 cubic feet with the rear seat folded. Its innovative “Magic Seat” arrangement means the rear seats can fold up as well as down, supplying enough space inside for a bicycle. 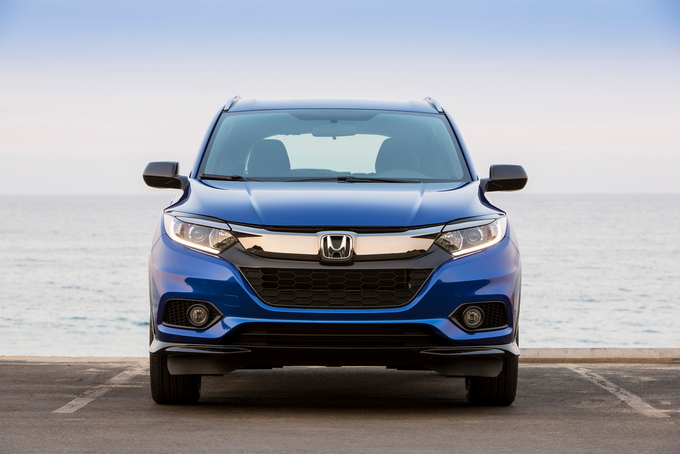 Honda equips the 2019 HR-V with a 1.8-liter four-cylinder engine that makes 141 horsepower and 127 pound-feet of torque and works with a continuously variable transmission (CVT). Front-wheel drive is standard; all-wheel drive is available for $1,400 across the lineup except on the top-level Touring model, where it's standard. The powertrain offers tepid power and a leisurely drive. 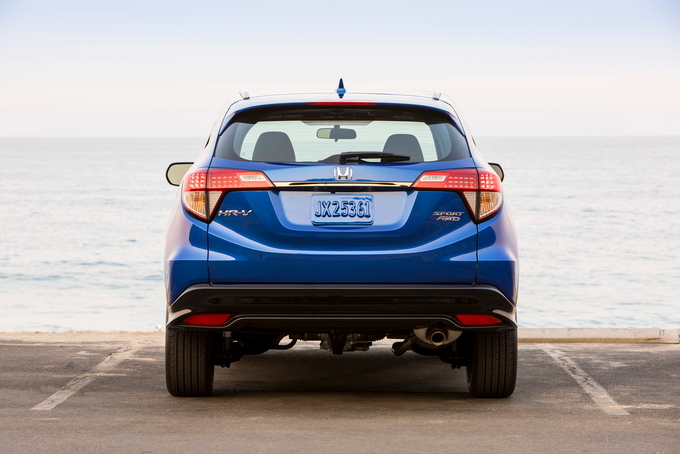 In exchange for its modest-at-best power, the HR-V delivers very good fuel economy. The front-wheel-drive model earns an EPA-estimated 28 miles per gallon in the city, 34 mpg on the highway, and 30 combined. Choose all-wheel drive and this model earns 27/31/29 mpg (city/highway/combined). The 2019 HR-V comes in LX, Sport, EX, EX-L, and Touring trims. All packages are wrapped within their respective trims. Kicking things off is the HR-V LX, which is priced from $21,515 (all prices include the $995 destination charge). Standard exterior features include halogen headlights, 17-inch alloy wheels, a rear spoiler, power windows, power door locks, a tilt-and-telescopic steering column, air conditioning, and cloth seats. A four-speaker audio system with a five-inch screen, Bluetooth, and a USB port are also included. The HR-V Sport is priced from $23,215. Building on the base model, the Sport also offers unique styling cues, including blackout trim and 18-inch alloy wheels. Fog lights and roof rails are standard. Inside, the special look includes a black headliner, gloss-black trim, and sport pedals. At this level, the HR-V offers a more robust technology roster. You’ll find a six-speaker audio system with a seven-inch display, Android Auto and Apple CarPlay smartphone integration, and HondaLink. Honda prices the mid-level EX trim from $24,715. Here, Honda includes automatic headlights, heated and power-controlled side mirrors, a moonroof, and specially painted 17-inch alloy wheels. Push-button start, automatic climate control, heated front seats, satellite radio, and HD Radio are also standard. The Honda Sensing suite is included on the EX, which features forward collision warning, lane departure warning, automatic emergency braking, lane keeping assist, adaptive cruise control, and road departure mitigation. Choose the HR-V EX-L model and the price starts at $26,315. The enhancements on this model include a leather-wrapped steering wheel and shift knob, an automatic dimming rearview mirror, and leather-trimmed seats. The top-of-the-line Touring model comes in at $29,535 and comes with standard all-wheel drive. Among the features exclusive to this model are LED headlights, LED fog lights, and underbody spoilers. The Touring also has HomeLink, an eight-way power driver’s seat, and navigation. Choose the 2019 Honda HR-V Sport if you like a crossover with a flashier persona. However, if advanced safety features are desired, then the EX is where you’ll want to begin your search. One of the more established players in the hot compact crossover class, the Honda HR-V was an innovator when it debuted in 2016 and the 2019 model continues to offer a smooth ride, good value proposition, and a brilliantly versatile interior with class-leading cargo space. At the same time, advanced safety features are missing from the most affordable models, acceleration is slow, and, in an ironic twist, the new Sport model, which offers no performance advantage, is introduced just as the manual transmission is dropped from the lineup. Buyers have plenty of options when running through the 2019 Honda HR-V lineup with its five trim levels. From the base to range-topping trim, these include: LX, the new-for-2019 Sport, EX, EX-L, and Touring. In addition to a wide range of features and options, all models are available with either front- or all-wheel drive. Inside, the upgrades include a larger seven-inch touchscreen, improved audio system with Apple CarPlay, Android Auto, HondaLink, and SMS text message capability, a leather-wrapped steering wheel and shift knob, and sport pedals. Despite the sportier look, we'd opt for the mid-range EX trim that adds a slew of standard safety tech at a still-affordable price point. Upgrades over the Sport trim include heated front seats, keyless push-button start, automatic climate control, a power moonroof, heated mirrors with integrated turn signals, and smaller 17-inch alloy wheels. Additional standard safety equipment includes lane departure warning, lane keeping assist, road-departure mitigation, automatic emergency braking, adaptive cruise control, Honda LaneWatch – features not available on either the LX or the Sport. 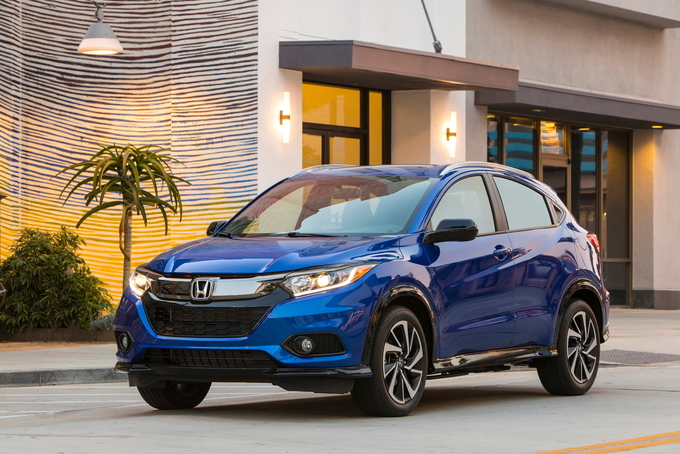 The 2019 Honda HR-V’s 1.8-liter four-cylinder engine matches up nicely with CVT for smooth, seamless acceleration around town. The quick, responsive steering makes zipping in and out of city traffic a breeze, further enhancing in-town driving. Comfort is also surprisingly high for such a small crossover. The compliant suspension – MacPherson struts up front, torsion beam in back on 2WD models and a more sophisticated DeDion setup on AWD models – handles everything from small road imperfections to large potholes with ease, even when equipped with the larger 18-inch wheels found on the Sport model. The HR-V also handles curvy back roads better than most in this class, although it's not as entertaining as the Mazda CX-3. There’s available all-wheel drive on all trim levels – standard on the Touring trim – which doesn't force buyers living in cooler climates who need more traction into higher trim levels just to get it. That said, the HR-V is slow (and we mean molasses slow) in anything other than normal city jaunts. And while Honda has done a yeoman's work in perfecting the HR-V's CVT by eliminating most of the "rubber band" effect of earlier units, hard acceleration still results in engine drone. In addition, front-wheel-drive models inexplicably have more ground clearance than versions with all-wheel drive. Topping things off, the HR-V's average-at-best fuel economy offers no trade-off for its sluggish performance as it falls behind some of its more fun-to-drive competitors with an EPA-estimated 28 miles per gallon city, 34 mpg highway, and 30 combined with front-wheel drive, or 27/31/29 mpg on all-wheel-drive models. The HR-V's design – especially up front – is a bit busy for our tastes, but hardly offensive. The 2019 version benefits from a mild refresh that includes revised bumpers, a more aggressive grille and lower air intake, and narrower headlight enclosures. In back, a narrow chrome strip bridges the gap between the taillights (with new standard LED brake lights), while the lower valance is more sculpted. Our tester, an example of the new Sport trim finished in Orangeburst Metallic, kicks things up a notch over the base LX with gloss black outside mirrors and lower side sills, larger 18-inch matte black-trimmed alloy wheels, brushed silver roof rails, fog lights, a chrome exhaust tip, and a quicker steering ratio. Moving inside, styling points are gained with a simple cabin that's functional and more than a touch stylish. There are plenty of soft-touch materials throughout the cabin, giving the HR-V a more upscale feel than its moderate price tag may indicate. Features are plentiful in each trim. Interior comfort is another high point, especially for those up front with firm, comfortable seats that are nicely bolstered, making the HR-V more comfortable than most of its competitors. The backlit gauges in front of the driver (tach to the left, speedo center, and info and gas gauge on the right) are clear and easy to read, while the various buttons and knobs are silky smooth, intuitive, and within easy reach of the driver. Responding to criticism that dates back to the original model, Honda has added a real on/off volume button to the in-dash infotainment screen, although simultaneously eighty-sixing the CD player. The highlight, of course, is the HR-V's roominess and incredible versatility. Borrowing a page from the Fit's playbook, the back "magic seat" lower cushions individually flip up and back, and can be locked in the vertical position to carry tall items (large boxes like a big screen television or, in our case, an antique chair behind the driver's seat) – something no other vehicle in this class can do. Flip those seats down, and passengers are treated to 39.3 inches of rear-seat leg room. But the goodness doesn't end there. 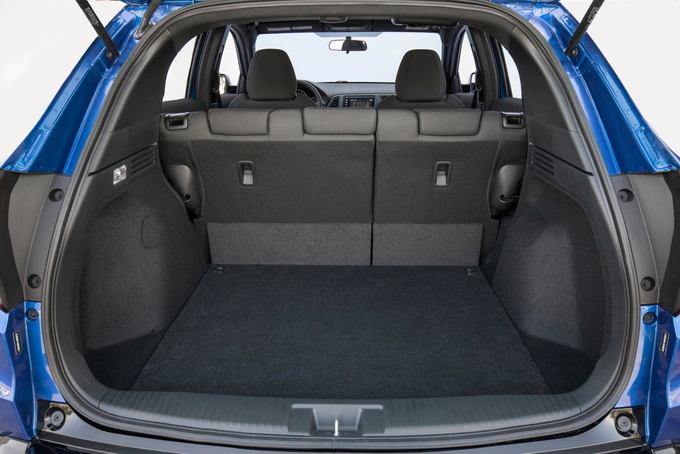 Cargo volume behind the back seat ranges from 23.2 cubic feet on AWD models to 24.3 cubes on those with 2WD. Flip the back seats forward – they fold completely flat – and you expose 57.6 cubic feet of cargo space on AWD models that rises to 58.8 cubes with 2WD – making the HR-V the most cargo-friendly vehicle in its class. At the same time, the HR-V does itself no favors with its coupe-meets-crossover styling. It tries to be playful, which is fine, but despite the clever way the rear door handles are hidden, it ultimately delivers a mixed message that only certain buyers will love. The HR-V’s cabin isn't only comfortable and functional, it has the cargo-hauling capabilities of much larger vehicles. At the same time, its engine is underpowered, making for sluggish acceleration, and the lack of a manual transmission option exacerbates this issue. The HR-V is perfect for young buyers and empty-nesters looking for a smaller vehicle with a higher ride height, extra roominess to move items, and enough leg room in back for friends and family. A commuter who does long stretches of highway driving will likely prefer the acceleration and fuel economy of some HR-V competitors. Subcompact crossovers rarely measure well as they are mashups of a few segments made to work well for specific buyers. But the 2019 Honda HR-V is one of the better options in its class despite some notable flaws. Where it excels is its cargo and people hauling, where it's at the top of the class. We have partnered with trusted dealers in your area to give you a great price on the new Honda HR-V.